Protect and moisturise while delivering a smoother shave. Wahl 5 Star Pre-Shave Oil is rich in natural oils and helps to pave the way to a smoother, more enjoyable shave with its fresh minty fragrance. 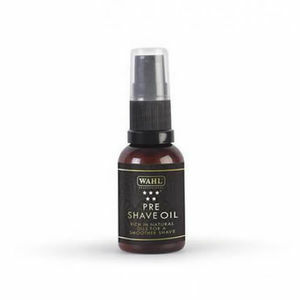 It keeps skin moisturised and helps to provide extra protection during the shaving experience. It's been designed to give a close shave and to help banish irritation. Simply rub oil onto dampened face and neck, then it's time to get busy with blade or electric razor to create your clients' desired looks. £9.59 (inc. VAT) Why no VAT? We're a trade wholesaler and quote our prices without VAT to help our VAT-registered customers understand the true cost of a purchase.